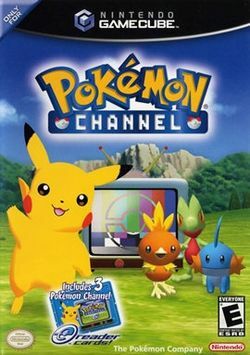 Pokémon Channel is a game where you help Professor Oak with a new Pokémon television channel that he is putting together. You spend your time watching television, playing interactive quizzes, shopping for items, and exploring the world outside. You also get your very own Pikachu to interact with, which tends to be quite interesting. Pokémon Channel is one of the few games that takes advantage of the Nintendo e-Reader and various e-Reader cards. Pokémon Channel is a TV-broadcasting network that airs a variety of Pokémon programs. You have been selected as part of the initial test audience! Please send me your REPORT on Pokémon Channel after you have viewed the programs on offer! Here at Pokémon Channel, we are collating viewer feedback to make our programming more appealing to everyone, even Pokémon. So sit back with Pikachu and enjoy our programming. Oh, and please don't forget to check back in and report to me so I know what you think! Your feedback will determine the success of our new TV-broadcasting network. I'm counting on you! This page was last edited on 7 September 2015, at 05:42.